Once you have successfully set up your company Slack integration, you'll have access to a new Slack command, /praise. To give feedback in slack, in any channel use /praise followed by the Slack username of the person (or people) you want to give feedback to, followed by the content of your feedback. Once you hit enter we will automatically create a piece of public feedback in Lattice for you. 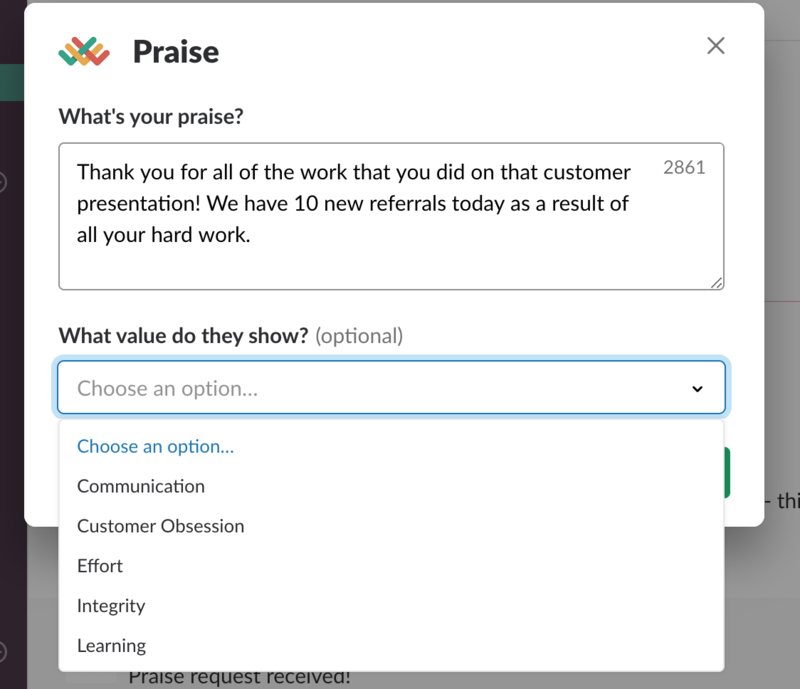 If your company has Values enabled in Slack, you will be prompted with a pop-up window to add the company values to your Slack Feedback. Once you have finished adding the Values, click submit and the feedback will appear in both Slack and Lattice. From here, your public praise will be posted into Lattice and into the public Slack channel (if you have this set up). For more information on setting up the public channel, click here. Note: you can still use the custom command “/praise” in your public Slack channel to give public praise.